I get asked what the ideal length for a video is quite a bit. In fact I’ve blogged about it once or twice in the past. The answer, I’ve decided, is how well does your audience know you? This is where a content strategy as part of your marketing funnel comes in. 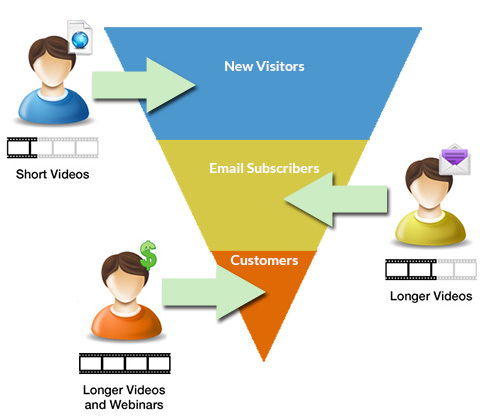 I use the term “marketing funnel” but the term is really a misnomer. A funnel implies that everything goes in and proceeds to the bottom. When it comes to marketing and your online content, a better analogy is really a snowstorm. Some of the snow lands in your backyard, some blows into your neighbors yards. Snowflakes are like website visitors – the key is if they drift anywhere near your yard, make sure that the vast majority land there and ultimately become customers. That’s hopefully the end goal anyway. That being said a funnel is a much easier thing to illustrate for the purposes of video content so I’ll just stick with it. If you want to make sure that the maximum amount of people view your videos, your video needs to be short. Very short, two minutes at the absolute most while somewhere in the neighborhood of sixty to ninety seconds is ideal. It’s an introduction – short, witty and to the point. It’s an elevator pitch. You really want to design this content so it piques the viewers curiosity and gets them to the next step of your re-marketing to them – whether that is to sign up for a free trial, subscribe or whatever the call to action is for your video. People who are just browsing to look for a solution to their problem, will not be willing to invest a lot of time. Make sure that your target message really sticks to one important point per video. Subscribers, customers and people familiar with your brand will spend longer with your content once they know you, particularly if they feel that your product or service could be the answer to their needs. Here are videos usually two to ten minutes that could include in-depth product or service tutorials, company culture videos, longer case study testimonial videos, etc. Anything that really does a deeper dive into what your product or service does and how it helps with more specific details. For instance we created a top of the funnel video for a cloud based app-testing service and then developed ten more middle of the funnel videos speaking to specific functions like how cloud based testing works, desktop app testing, mobile app testing, etc. This type of video content should be designed for people who have shown an interest in your product but are looking to get more information about how it can help their specific set of needs. This is where your customers and brand advocates are. If they have gotten to this stage, then they are very familiar with your products or services and find the content you are producing valuable. This is a captive audience who have no problem sitting through a ten minute or longer webinars or in depth tutorial videos. Here is where you can provide value added content by interviewing industry experts or hosting webinars on specialty aspects of your industry. This content doesn’t specifically promote your product or service but is usually educational content around the industry your product or service assists. For instance HubSpot provides an all-in-one marketing software solution and their bottom of the funnel content includes a wealth of online marketing webinars and longer form content including a weekly marketing update podcast. They also frequently include top of the funnel videos on landing pages specifically designed for this longer form content. Why? Well, when those “snowflakes” are “drifting” out there, you can’t always control where they are going to land first. So once a snowflake or “lead” drifts near your backyard you need to nurture it to keep it there. What is that snowflake looking for? A constantly cold temperature? Other snow flakes to mingle with? No dogs sniffing around to make them yellow? Alright, I’m done with the snowstorm metaphor for now, but you get the picture. The idea is you want more snackable content on landing pages of your website to attract more quality leads, provide more in depth content for those who are familiar with your brand but are not at a purchasing stage yet and longer more in depth video and offerings to your keep your customer base engaged. Are you employing these tactics with your video marketing? I’d love for you to share any ideas or success stories you’ve had.